Utkarsh Micro Finance, which has secured the Reserve Bank of India (RBI)’s nod to set up a small finance bank, aims to more than double its loan portfolio in the next 18 months. On a list of 10 lenders, issued by RBI on Wednesday, Utkarsh is the lone entity based in Uttar Pradesh. ALSO READ: MFIs dominate small finance bank licences Against the current portfolio of dues of Rs 910 crore, the company aims to touch Rs 2,000 crore by March 2017, and expand it further to Rs 3,000 crore in the two years after that. The Varanasi-based company has 293 branches and 2,200 employees. Consolidated disbursements are about Rs 2,300 crore. These include group lending, micro enterprises and housing loans. 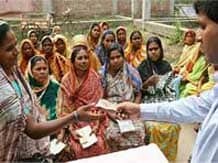 On February 6, RBI had issued a list of 72 companies which had applied for a small finance bank licence, to enable them to primarily serve unbanked and remote areas. Of these, four were from UP. The other three were Sonata Finance, Lucknow; Proficient Leasing & Finance, Allahabad; and SE Investments, Agra; and Utkarsh Micro Finance Private Limited, Varanasi. Now, Utkarsh has emerged as the lone micro lender from UP to figure in the fresh list of future banks. In November 2014, the RBI had introduced the concept of niche banking in India by issuing norms for payments and small finance banks to allow mobile firms and supermarket chains to enter banking arena and cater individuals and small businesses. The move, aimed at deepening financial inclusion and boost saving habits, had come within seven months of RBI issuing two full-fledged banking licences in April 2015 after a gap of over a decade. Talking to Business Standard over telephone, Utkarsh corporate communications head, Ashwani Kumar, said the company had another 18 months to actualise its road map before RBI granted it the full licence to operate as a bank. “We are confident of meeting the RBI parameters within the next one year,” he added. At present, Utkarsh operates in nine states, namely, UP, Bihar, Jharkhand, Madhya Pradesh, Maharashtra, Delhi NCR, Uttarakhand, Himachal Pradesh and Haryana. "Almost 80 percent of our branches are in the underbanked pockets and we plan to consolidate our position in these areas before expanding further," Kumar informed. Besides, the employees count would be ramped up to 5,000 in the next few years.